There are so many great things to having a pet bunny. For one, they’re very fluffy and adorable. This alone already attracts millions of people around the globe to care for them. Two, they’re very smart. Some rabbit parents will tell you just how bright these creatures are, making them even more attractive animal companions for some folks. You can also get a bunny for really cheap, so a lot of people think they’re great starter options to become a pet parent. If you’re interested in getting a rabbit, you should also know, however, that these animals require proper care as well. The best rabbit cage is just one of the requirements for having a rabbit in your home, so we’re sharing a few tips on how to find the perfect match for your fur baby’s needs. Buying Guide: What to Look for in the Best Cages for Rabbits? The idea when it comes to critter cages is the bigger it is, the better it will be for your pet. This is particularly true for your rabbit, especially if she’ll be staying inside for long periods within the day. Experts say that it should at least span three to four hops and tall enough to provide ample clearance when your pet is standing on her hind legs. If you want an actual figure, some experts recommend providing bunnies at least 8 square feet of enclosed space. As for their exercise space, they should have at least 24 square feet to play in for at least five hours a day. These will ensure that they’re always happy and healthy. If their home is big enough but they appear to be aggressive, you must consider spaying or neutering them. Rabbits have sensitive legs so you can’t put them in a cage where their feet will get in constant contact with hard uneven bumps that wire cages have. A cage with a plastic pan bottom is still the best option for rabbits. A multi-story rabbit cage will provide more ways for your pet to explore and move around inside her cage. While some units don’t readily come with ramps, looking for cages that you can equip with a few ones will be the next best thing to do. Being preys, rabbits also need hideouts where they can retreat to when stressed. Like ramps, however, these might not be readily available in many great cages for rabbits, so you should at least look for a unit that will easily accommodate one or two of these things. This is particularly important if you have cats, dogs, and kids at home that will try to get to your bunny. A unit that locks well will help keep your pet safe while you’re not home to supervise its activities. Base models have safety lock very similar to hamster cages, and you definitely want something safer. Designed especially with pocket pets in mind, the Living World Deluxe Habitat has everything a rodent or bunny needs to create a comfortable nest. 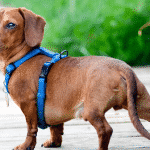 Available in three sizes, the X-Large option will already be a great fit for your pet. Despite not large enough to fit multiple rabbits at once, this product still has a few notable features that make it the perfect addition to this list. First of which is the elevated ledge/hideout that it comes with. Not only does it serve as an excellent hideaway for bunnies where they can retreat to in times of distress, but it’s also a great place for them to stash away their toys and other things. As it also doubles as a ledge, it provides additional floor space to the cage. Your pet can easily climb on top to enjoy better views around her. This product also comes with a few more accessories that are very useful in keeping your bunny happy and healthy. For one, it has a hay holder that’s easily accessible to your pet. It also has a drinking bottle that is designed to be leakproof. Then there’s the food dish that comes with the unit that you can lock in place on top of the ledge, making it impossible for your pet to move it around and make a mess. This cage is also nicely designed in terms of security and accessibility. The roof opens up halfway or fully and locks securely with a few knobs. It also has a front door that you can attach a ramp to so your pet can easily go in and out of it. While this unit is specifically made for guinea pigs, it really won’t hurt for your pet rabbit to enjoy it as well. Why? This is mostly because both creatures have similar basic needs when it comes to their housing, so you can be guaranteed to feel comfortable in this MidWest product. How? For one, this Guinea Habitat provides 8 square feet of space - the same minimum measurements for a cage required for both guinea pigs and bunnies. 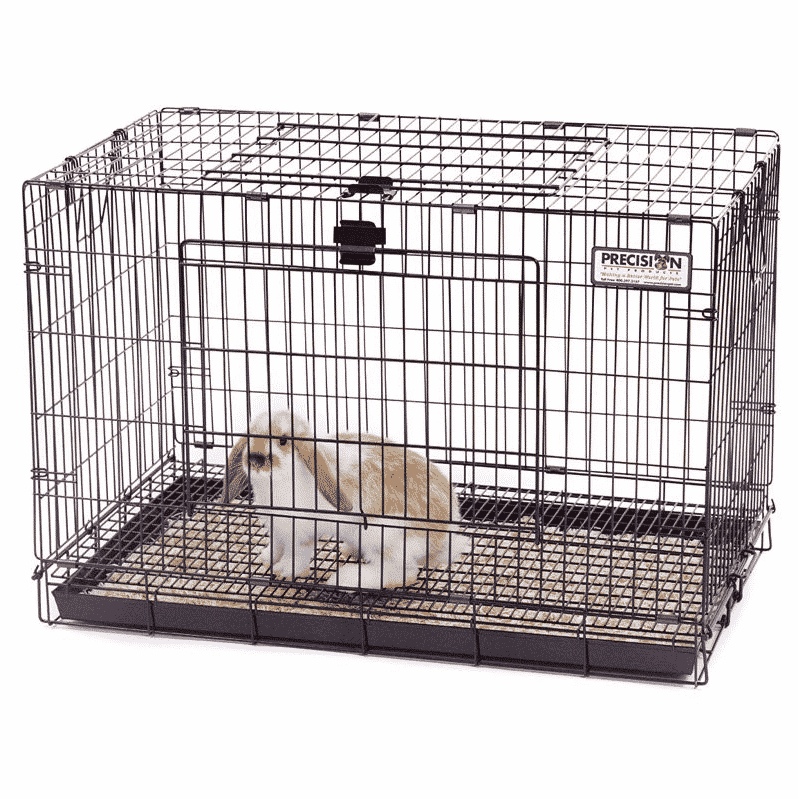 This alone is enough reason for lots of parents to opt for this product, but combined with its very friendly price tag, it is easily considered as the best cage for a rabbit today. Another great feature this unit offers is its versatility. As it is designed to stand up without having to be clipped to a solid bottom pan, it can also double as an outdoor cage for your pet. All you need to do is to move the wire part outside, set it on the ground, and place your bunny inside. This makes it not just one of the best indoor rabbit cages today, but also a fantastic outdoor cage even if you should only leave it outside for a few hours at a time. Another pro for this product is its heavy duty canvas bottom. While other units make use of plastic pans, this unit has a specially designed PVC-lined canvas base so you’re guaranteed that it won’t leak and will be very easy to clean. However, this unit doesn’t really come with a lot of accessories. It only comes with a single divider and ramp. It shouldn’t be an issue, though, because it is very affordable for its massive size. You can buy the food bowl, water dispenser, and hideout separately, letting you personalize your pet’s space even better. Dubbed as the perfect rabbit habitat, the MidWest Wabbitat is an excellent option off this list for so many reasons. First off, the name of this product is ridiculously silly, so that’s a big point. It’s pretty witty and suits the unique product nicely. Secondly, it’s designed with your convenience in mind, making pet parenting a breeze. As the Wabbitat resembles a dog crate, it’s easy to expect its ease of use, which is one of its biggest draws. Unlike other rabbit cages, it has a plastic pan that you can easily slide in and out of the unit, making it very easy to clean. Because of this, however, it has a wire mesh bottom so your pet’s waste will quickly transfer to the plastic pan and so your rabbit can avoid stepping on them. Just make sure to add a solid surface on the opposite side of her “toilet” area, so she’ll be more comfortable when just chilling out. Touted as a great starter cage for rabbits, it’s not as big as required by experts, but for those who intend to let their pet move around the house most of the time, it can already be a good choice. Equipped with two doors, one on top and another up front with a flip down door that doubles as a ramp, it can allow your pet the freedom she wants to go in and out of her cage. It also provides you a good deal of easy access to your pet. Its locks are worth noting as well. The latch for its front door slides easily to open, so it can be difficult for prying hands to tamper with but easy for you to open even with just one hand. This makes it even more convenient and a good option for your rabbit’s housing. If you want something cuter than the Wabbitat, the Kennel-aire “A” Frame Bunny House is another option worth checking out. Its most notable detail is its A-shaped roof, providing extra clearance for your pet and making it an adorable “house” for your fur ball. It’s front door even swings open, so it really looks like a miniature home that’s undeniably endearing. Like the Wabbitat, this unit is also very easy to clean. It also makes use of the slide out pan so you can quickly remove your pet’s waste without having to relocate her or disassemble the entire cage. However, it also makes use of a wire mesh flooring, so you have to get an additional flat, solid product for flooring to provide her a comfortable spot to lounge on. Another unique feature of this product is its wheels. You can actually cart around your pet in this unit, making it a lot easier for the both of you to just hang out in the different parts of your home while your pet is not yet litter trained. As for accessibility, this unit is designed with one of the roofs opening completely so you can easily reach inside the unit. You can use it to easily place her food, toys, and other items inside without having to struggle with the size. Hutches are also great options for bunny housing but most of them are often used outside. But since bunnies are social animals, they might not like being kept outside without seeing their owners, so a genius solution would be to turn a hutch into the best rabbit cage for indoors. The Petsfit Rabbit Hutch is a great example of one, so if you prefer having a hutch for your fluffball, this might just do the trick for you. Being a hutch, this unit is a lot different from the other best rabbit cages in the list as it is composed of two areas, one is inside the mesh wire area and the other is an enclosed hideout space that’s made from actual wood. It effectively provides your pet the retreat she might need in a busy household, as her hideaway is quite spacious. It’s also important to note that this product is very easy to clean. It might not seem like it at first glance, but since its bottom can be easily pulled out, you don’t have to worry even if your pet is not yet litter trained. As for accessibility, the whole cage is very easy to access. The hideout’s roof opens completely and comes with a device to keep it up so you won’t have to struggle to reach in for your pet. The wire cage side also has a front door and a roof that opens halfway so you can easily access your pet while she’s lounging there. Read more about how to choose the best rabbit hutch in our reviews! If you’re one of the lucky folks who has the covered outdoor space that can be a perfect spot for your pet’s outdoor home, this product from Advantek is worth check out. The Stilt House Rabbit Hutch is designed specifically for fluffballs to have ample room to move around in, without you having to give up valuable floor space inside your humble abode. Made from wood and metal, this rabbit hutch will provide a comfortable home for your beloved bunny. 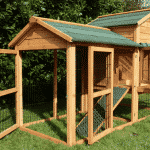 Designed as a multi-level home, it has every feature your bunny needs. It has ample space, a hideout, and a ramp to climb. It’s also easy to clean with its pull-out tray and easy-access doors. The price for this product is a great plus as well. For something made with wood and metal, it’s actually very inexpensive. With some skills, some people even turned this unit into the best indoor rabbit cage. By adding a flooring, you can already prevent your pet from ruining your actual floors and you even get to enjoy each other’s company all day long. For a fuss-free and no-frills housing solution for your pet rabbit, Ware Manufacturing’s Home Sweet Home Pet Cage can also be an option. Available in three sizes, the largest one can already be a good starter unit for your fluffball, giving her a comfortable and secure space to lounge around in while you’re not yet home and ready to supervise her moving around the house. Designed with a solid plastic bottom and a wire cage upper, this product offers comfort for your fur baby. Her feet won’t get hurt from the flooring and you don’t have to worry about ventilation. The size may already be big enough for her to stay in if you give her outside time every day as well. Secure, accessible, sturdy, and durable, this might just be the best rabbit cage in a fuss-free home.